The North Platte semi-weekly tribune. About The North Platte semi-weekly tribune. Vol. 10, no. 52 (Jan. 1, 1895)-38th year, no. 102 (Dec. 29, 1922). Description based on: Vol. 10, no. 52 (Jan. 1, 1895). Fort McPherson was established in 1863 in an area that later became Lincoln County, Nebraska. The siting of the fort proved fortuitous as various Indian raids and wars, such as the Plum Creek Massacre, broke out nearby in 1864. In November 1866—only three years after the wagon train massacre—North Platte, Nebraska, was platted by General Grenville Dodge for the Union Pacific Railroad. The town grew up almost overnight, attracting more than 5,000 people. Most early inhabitants were railroad laborers, gamblers, and adventurers, making the place a rough-and-tumble frontier town. One account said "Neither property of life was safe." Within two years, the lawless hordes moved westward with the railroad and North Platte settled down into a prosperous community that officially became a city in late 1875. In 1878 Scout's Rest, the house of William F. "Buffalo Bill" Cody, was completed near North Platte, and Cody joined his family there. North Platte and Lincoln County boasted many newspapers with various political views and agendas, including the following related titles. The Lincoln County Tribune was published from 1885 to 1890 by Ira L. Bare & L. A. Stevens. 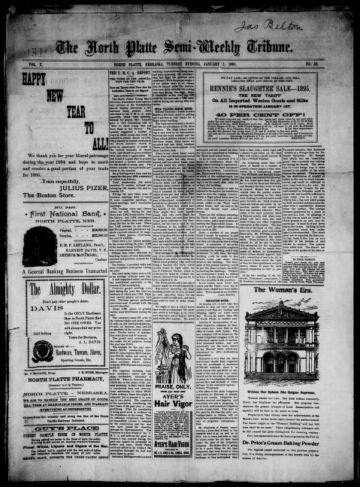 Subsequent titles were the North Platte Tribune (1890-94), published by Bare & Moulden, and the North Platte Semi-Weekly Tribune (1895-1922), also published by Bare. The annual subscription prices ranged from $1.25 to $1.50 per year. Bare was originally from Pennsylvania and headed west to Colorado in about 1880. He moved to North Platte in 1881 where he worked for another paper until he was able to establish the Tribune. The Tribune was described as "Republican in politics and alert to all local happenings." Bare became an influential North Platte citizen, using his position as owner and editor of the paper for progressive causes. Although the North Platte Semi-Weekly Tribune has long since ceased publication, North Platte continues to be an important railroad town to this day. It boasts the largest train yard in the world—the Union Pacific's Bailey Yard, encompassing 2,850 acres.